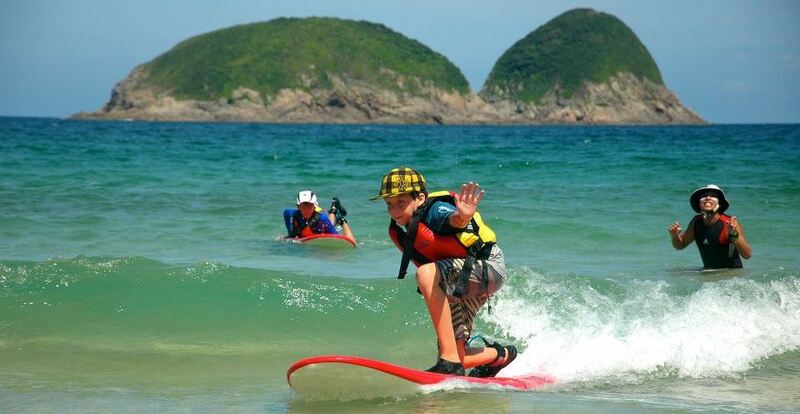 WHAT: One of the four beaches that make up the Tai Long Wan (Big Wave Bay) area, Sai Wan is the location of one of the popular surfing destinations in Hong Kong. WHERE: Located in the Sai Kung East Country Park, it is accessible from Sai Kung town by bus. ACTIVITIES: Coastal Watch, Leadership camps, surf, bodyboard, kayak, canyoneering, challenge course, orienteering, scavenger hunt, habitat study, nature walk, night walk, camping, camp craft, swimming, beach activities. WHAT: A quiet island steeped in pirate history and even more ancient culture, with popular beaches and coastal paddling. WHERE: located a short ferry ride away from Central. ACTIVITIES: Nature walk, farming, kayaking, village history walk, PFS, beach activities, coastal exploration, service, cooking, pirate history, night activities, Coastal Watch. WHAT: a secluded island with a YMCA youth camp on-site and a remote island with excellent snorkeling. WHERE: located a short boat trip from Sai Kung town. ACTIVITIES: Camping, Camp craft, Cooking, Survival, Sea kayaking, Orienteering, Nature Walk, Habitat Study, Mangrove exploration, Coasteering, Snorkeling, Beach activities, Swimming, Night walk, night games, campfire, star-gazing. WHAT: an educational eco-farm and a community restoration project. WHERE: located in the karst hills of Guilin, China. ACTIVITIES: Planting, composting, picking and eating, cooking, habitat hike, river kayaking, swimming, river exploration, hiking, camping, fishing, bicycling, bamboo crafts, culture walk, mud brick-making, night activities, service. WHAT: the ideal spot for kayak training, kayak expeditions or a weekend getaway with friends and family. WHERE: a remote bay located to the northern end of the Hong Kong Geopark. ACTIVITIES: Camping, cooking, kayak training, kayak expeditions, snorkeling, hiking, beach activities. WHAT: A fishing village with a strong tourism draw, Tai O is famous for its stilt houses and as the jumping-off point for seeing the Chinese white dolphin. WHERE: Located on the southwestern end of Lantau island. ACTIVITIES:leadership camps, camping, canyoneering, culture walk, dolphin spotting, kayaking. WHAT: a heritage preservation area with strong links to the Chinese diaspora. WHERE: located in the Kaiping area amongst UNESCO World Heritage sites. ACTIVITIES: heritage preservation, Chinese diaspora, biking, hiking, cooking. The Cangdong village programme is situated among UNESCO world heritage sites. The emphasis is on an authentic chance to experience a rural agricultural way of life, while also understanding the significant achievements of the Chinese diaspora that moved to many parts of the world from this area. The effects of this migration – especially in human, economic and cultural terms, including the extraordinary architecture that resulted, provide really interesting opportunities for creating meaningful programmes. 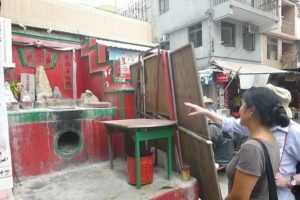 Hands-on opportunities include architectural heritage preservation and traditional wood fire cooking, as well as cycling the flat and uncrowded Guangdong Greenway cycle paths that link the many interesting locations available. Heritage preservation, Chinese diaspora, biking, hiking, cooking. 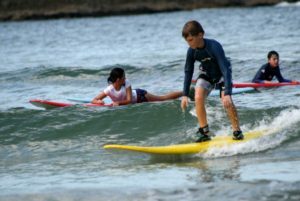 One of the four beaches that make up the Tai Long Wan (Big Wave Bay) area, Sai Wan is the location of one of the popular surfing destinations in Hong Kong. It is also home to some of the most fascinating geological formations in Hong Kong, with volcanically-formed columnar-jointed fine-grained tuffs forming steep cliffs, sea caves and arches. These formations make it a spectacular part of the Hong Kong Geopark and a Site of Special Scientific Interest. With this backdrop, the Sai Wan area is one of the most beautiful areas in Hong Kong for activities and exploration, expanding our understanding of the natural world and our place in it. The cleanest water in Hong Kong makes this an ideal place for water-based activities. The remoteness of the location means that it is one of the best places to have a chance to see stars in the dark sky. Exploring the coastline from the comfort of a kayak is also a great way to learn more about the fascinating geology of the Geopark. Coastal Watch, Leadership camps, surf, bodyboard, kayak, canyoneering, challenge course, orienteering, scavenger hunt, habitat study, nature walk, night walk, camping, camp craft, swimming, beach activities. Tai O village’s placement on the end of Lantau island means it is well-situated to take advantage of the bounty of the sea. A fishing village with a strong tourism draw, Tai O is famous for its stilt houses and as the jumping-off point for seeing the Chinese white dolphin or locally known “pink dolphin” habitat, currently being carved up by construction on the Macau-Zhuhai-Hong Kong bridge. Existing for hundreds of years in its current location, Tai O started as a place for salt production. As time went on, salt production declined and fishing became more prominent, though today’s fishing capacity is highly impacted by modern fishing methods. As fishing declined, Tai O found itself as a tourism spot, where visitors from the city can see an old way of life. Through it all, persevering in the face of adversity, whether it be storms, fires or government intervention, Tai O survives and is now one of the best places in Hong Kong to see the endangered “pink dolphin”. Leadership camps, camping, canyoneering, culture walk, dolphin spotting, kayaking. 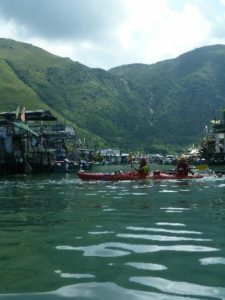 Located in the remote northeast of Hong Kong, in Long Harbour, Tan Ka Wan is the ideal spot for kayak training, kayak expeditions or a weekend getaway with friends and family. With a fully outfitted village house as one accommodation option and a sheltered campsite as another, groups can find their preferred style. A short paddle away is the well-known Tap Mun (Grass Island), busy on the weekends with day-trippers escaping the hustle and bustle of the city. Well known for its idyllic feel, this fishing village provides insight into a part of Hong Kong’s past where fish farms and small vessels ply the surrounding waters. Also accessible by kayak are snorkeling areas like Hoi Ha Marine Park and Port Island. The clear waters of the eastern side of Hong Kong are largely free of the pollution brought down from the Pearl River and provide ample opportunity for diving and snorkeling. With stony corals, reef fish, urchins and sea cucumbers amongst other lifeforms, there is plenty to see below the water. For stronger paddlers with more adventurous spirits, the Double Haven area, designated a marine park in 1996, is a fascinating place to paddle! Within sight of Shenzhen, it is possible to immerse yourself in small villages and cultural sites, camp on sandy beaches and get a feel of one of the remotest areas of Hong Kong. Nestled in the karst hills of Guilin along the Hua Jiang River lies an educational eco-farm; a fantastic location for connecting students with their food and how it comes to their table. Students can camp under the stars, removed from the light pollution of Hong Kong or sleep in the comfort of a dorm bed. The daytime explorations immerse the students in the natural world, learning about various habitats, connecting them in ways many modern youth do not get to experience in their daily lives. They will walk along the Tea Horse Route through ancient villages and farmscapes and learn about a fast disappearing way of life. 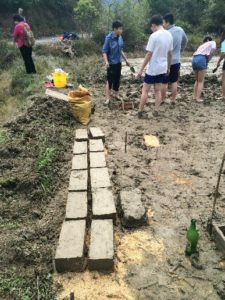 They can help serve the local community there by making mud bricks that will be used to rebuild the adobe houses in the community. 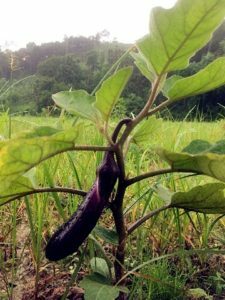 Planting, composting, picking and eating, cooking, habitat hike, river kayaking, swimming, river exploration, hiking, camping, fishing, bicycling, bamboo crafts, culture walk, mud brick-making, night activities, service. A short distance off the coast of Sai Kung town is Wong Yi Chau, a small island in the protected Shelter Bay area, where we base ourselves. Dorm and tent accommodation allow for a variety of sleeping experience, while the limited access and the 24-hour presence of YMCA staff allow for secure peace of mind. Here the camping experience can be explored with camp craft activities, cooking and night walks, exposing participants to new and unfamiliar experiences. Kayaking and mangrove exploration immerse the students in the coastal and marine environments. The second island visited is Sharp Island (KiuTsui Chau), the biggest of the 8 islands that make up the KiuTsui Chau Country Park, part of the Hong Kong Geopark. This area was once part of a 20 km wide volcano’s caldera, and the rocks below give evidence of that turbulent history. The surrounding corals are easy to access from the beach, as is the small island Kiu Tau connected to Sharp Island by a natural tombolo, exposed only at low tide. Here is where you will explore the natural surroundings, swimming over coral, clambering over rocks around the islands and running across the sandy beaches, as well as turning over rocks and logs to find what crawls beneath. Camping, Camp craft, Cooking, Survival, Sea kayaking, Orienteering, Nature Walk, Habitat Study, Mangrove exploration, Coasteering, Snorkeling, Beach activities, Swimming, Night walk, night games, campfire, star-gazing. Famous for seafood, it’s Bun Festival and its pirate history, the island that we know of today as Cheung Chau was originally two islands, before over 4000 yrs ago when sand and gravel were swept into the gap, connecting the islands by a natural tombolo. The human history of Cheung Chau goes back several thousand years, before much of what is now Hong Kong was settled, as evidenced by the Bronze Age (3500 yr. old) stone carving below the Warwick Hotel. Cheung Chau was eventually settled by peoples from several places in southern China – Hoklos, Punti, Hakka and Chiu Chau all made their way to Cheung Chau and formed distinct communities on the island, lending it a diverse collection of peoples. As Hong Kong became more prosperous and a centre of trade for Chinese markets, the lure of wealth and the multitude of hiding places along its many miles of coastline encouraged local pirates to ply the waters. The most famous of which is Cheung Po Tsai, who supposedly hid in a local cave. Participants can paddle the same waters as pirates, explore the diverse communities of the village area and learn more about the natural history of this fascinating island.